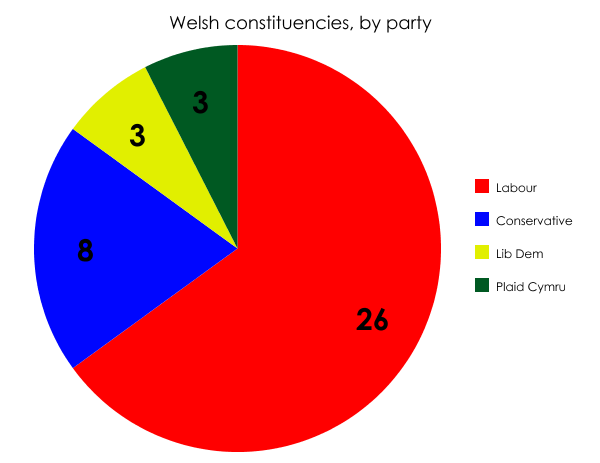 The current distribution of seats in Wales masks a mixed picture for all the main parties, including Labour. Despite its numeral dominance, Labour is far from the force it was once in this part of the UK and many of its seats now have slim majorities. The Tories’ fortunes have revived markedly since the party’s obliteration in 1997, to the extent that it is no longer particularly vulnerable here. And Plaid Cymru has dug in deep enough to be modestly confident of fighting off all challengers. It is only really the Liberal Democrats for whom the 2015 general election promises no positives. Two of Plaid’s three seats are Labour targets: Arfon and Carmathen East & Dinefwr. 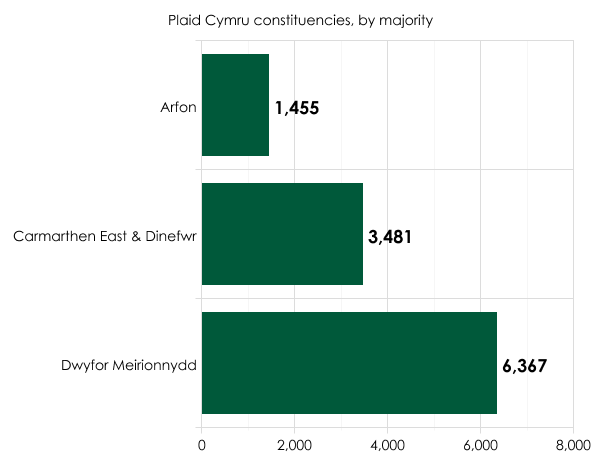 Arfon looks like it could be vulnerable, though Plaid holds the corresponding Assembly seat. I suspect all three constituencies may end up staying with Plaid. The party will throw absolutely everything into holding them, and Labour might find itself more preoccupied with trying to keep its many marginal seats elsewhere in Wales. 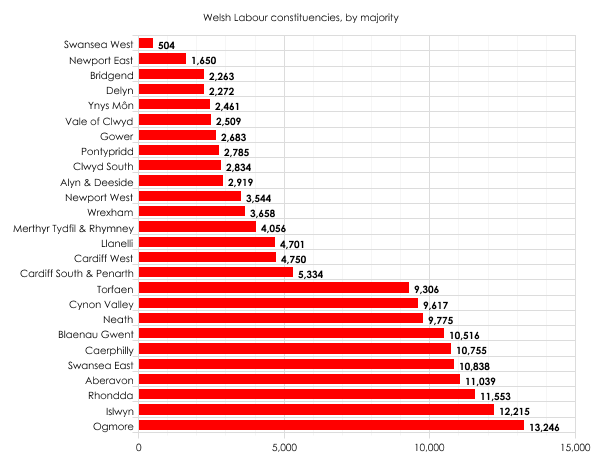 Plaid poses a serious challenge in two of those Labour marginals: Ynys Môn and Llanelli. The former was a Plaid seat from 1987 to 2001, and the party will be going all out to try and get it back. It has held the corresponding Assembly seat since its creation in 1999. As with Plaid, two of the Lib Dems’ three seats are targets: Brecon & Radnorshire for the Tories and Cardiff Central for Labour. Only Mark Williams in Ceredigion is safe. Labour will be itching to take back Cardiff Central, and given the criteria – city seat, large student population, Labour until fairly recently (2005) – the party should do it. If the swing in Wales from Lib Dem to Conservative matches the one forecast for the hunting ground of south-west England, Brecon & Radnorshire might fall as well. 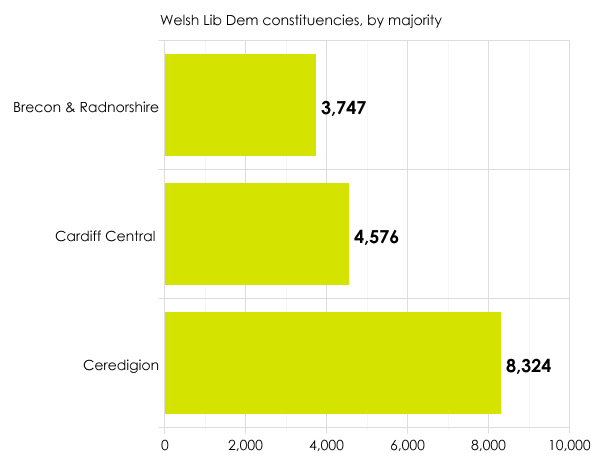 On paper, the Lib Dems are the challengers in six seats in Wales. In reality, I doubt they’ll make any gains at all. In 2010 they were only 504 votes behind Labour’s Geraint Davies in Swansea West and 1,650 behind Labour’s Jessica Morden in Newport East. But that was before they became a party of government, before the “broken promises” on VAT and student fees, and so on. If things go really badly for them on polling day, the Liberal Democrats could end up with just one MP in the whole of Wales. The Tories have staged a modest revival in Wales since their wipe-out in 1997. Of these eight seats, six are technically marginals. Montgomeryshire, where the Lib Dems are in second place, will be safe. The other five are Labour targets, and I’d expect at least one will change hands. Cardiff North, won by Jonathan Evans in 2010 with a majority of just 194, is definitely at risk, especially as Evans is not standing again. The majorities in the others aren’t so slim and this could limit the size of Labour’s advance. As for Tory targets, the party is second place in nine marginals. Its best and perhaps only chance is the Lib Dems’ Roger Williams in Brecon & Radnorshire. All the others are Labour seats, and none are ultra-marginals. A further advance in Wales feels a step too far for the Tories, at least at this election. Were the likes of Bridgend (Labour majority: 2,263) and Delyn (2,272) to change hands, we’d be looking at a landslide for David Cameron. Labour has to be cautious in Wales. Of its 26 seats, 15 are marginals. That’s not to say many or indeed all are at risk, but it means their campaign will necessarily be as much about defence as attack. This situation was largely caused by the 2010 election, where the swing away from Labour turned a host of safe seats into less-safe ones. The party’s current standing in Wales is at odds with the myth of the nation being as dependable a heartland for them as Scotland or north-east England. On paper, Labour has eight targets, two of which (the Tories in Cardiff North and the Lib Dems in Cardiff Central) ought to be within the party’s grasp. But the other six are long shots; the “easiest” is Aberconwy, where the Tories have a majority of 3,398. With all the parties fighting rearguard actions, Wales could end up the morning after the election looking virtually the same as it did the night before. For a part of the UK with so many marginal seats, such an outcome will disappoint as many as it pleases.